Tonight's raids were very different from yesterday's - not a continuous bombardment but single attacks as much as three hours apart. Power was cut to much of Baghdad in what appears to have been the first strike against the electricity grid. Within hours, however, many of the lights were back on. It's all quiet here tonight in Baghdad. Although there were some explosions earlier there has been nothing like the onslaught of last night, but who knows what will happen next. The Americans are really motoring towards Baghdad now, they should reach there in the next couple of days. But what they will do when they get there, we will have to wait and see, will they lay siege to the city and if so, for how long. The British units have moved north from here too into Iraq towards the city of Basra. The British say they want to surround Basra and see what resistance there is, they want to test the water and see what reception they might get before entering the city. They don't want to get into street fighting there. The military say this is not a strategic military target, so they don't want to go in until they are invited basically. The British forces haven't entered the city of Basra as they don't want to get into urban fighting. I think they are a bit worried about how the local population might react. They are sitting about 10km to the west. They may yet enter Basra over the coming days. It was the very first time the million dollar press centre has been used in Doha today, surprising considering that this is day three of the war. We had a broad brush stroke briefing today from General Franks, none of the nitty gritty details were forthcoming. The coalition forces are certainly determined to succeed but are worried about civilian casualties, they are trying extremely hard to avoid such casualties. The south of Iraq is in reality secure but for a some pockets of resistance. The British forces will be staying in the south now, securing the cities there and trying to open the port of Umm Qasr to get humanitarian aid in. Six plumes of smoke darken the desert sky and could continue to do so for many weeks. The US Marines are now moving on, heading north towards Baghdad. It appears that the power is out in the presidential compound. The rest of the city is lit up now, street lights, car headlights are all to be seen. City is quiet now as residents stay indoors. It's all gone quiet again, we've seen some missiles being fired. One came right over the hotel where we are. Some lights have come back on but the city remains mostly in darkness. We've heard two or three loud explosions. The air raid sirens haven't sounded. Bombing has started again here, some of the power in the city seems to have gone too. The wreckage of the two Sea King helicopters that crashed this morning is lying in international waters a few metres below the surface in the north Arabian Gulf. Heavy lift ships are on their way to the site now. So far just one of the seven dead has been found. The body has been flown back to the Ark Royal. Prince Saud al-Faisal has said the United Nations should be brought in quickly to manage the war and to plan for the reconstruction of Iraq. The minister also described as "inadvisable" US plans for an American general to run Iraq for up to two years. He said an American military man would not be able to deal with the complex social realities of Iraq's tribal society. America has given up hope of getting it's Fourth Infantry Division into northern Iraq via Turkey. After weeks spent waiting for Turkish permission to land, the ships carrying troops and equipment are heading for the Suez Canal, on their way to the Gulf, where they'll back up Divisions already in combat. The Pentagon accepts that as many as three US missiles aimed at Iraq might have landed in neighbouring Iran. At least one of the impacts was thought to be a Cruise missile launched from a ship in the Gulf. The Iranian authorities say several people were injured. Despite the advance of US-led troops deep into Iraq, the Kuwaiti authorities are still alert to the threat of a missile attack from across the border. I was caught outside the city, directly under the flight path of the two Iraqi missiles which impacted on Wednesday near the Fahaheel oil refinery, when the 11th air raid warning of this war sounded. People are increasingly blasé about these short alerts and few passers-by seemed concerned that there was nowhere to shelter. One of the problems in the fighting in Umm Qasr has been that some of the conscript army appeared to surrender, but then disappeared. It's thought they then took off their uniforms, became civilians, but kept their guns. And so they were effectively acting as a guerrilla force which makes it very hard for conventional armies to fight that because they don't want to risk killing civilians. As we drove into southern Iraq we were greeted by the smiling faces and waves from local people clearly happy to be free from the control of Saddam Hussein. The civilian population here have welcomed the coalition forces but have already pleaded for help to build the schools and hospitals they say they have long been denied. The British we've been talking to here say they're now planning to build the first Prisoner of War camp inside southern Iraq, somewhere near the port of Umm Qasr, to deal with the Iraqi prisoners who've already been taken. There will be a memorial service for the dead sailors and airmen on board HMS Ark Royal on Sunday morning. Some people have been speculating about the tiredness of the crew that died, but they've been getting exactly the same amount of rest as they would in peacetime. The Americans have engaged the army around Nasiriyah, but for most of the people living in Nasiriyah life goes on. It won't be until tomorrow that they have the sense that the Americans are the new authority in their neighbourhood. The town of Nasiriyah is all but in American hands, though there are pockets of resistance. But the impression I get is that some Iraqi forces are just drifting away from their units. The two vital bridges in the town which span the river Euphrates have been secured. I'm looking out now as this large convoy and can see local people in Basra . There are lots of people coming out, lots of children and they are applauding. The people coming out to shake the hands of American forces who are seen as liberating the city of Basra. This has a significant impact on morale. It's been a frustrating day for US Marines in the southern Iraqi port town of Umm Qasr. An operation to control the town which was expected to take a matter of hours, has now taken two days, and still there are elements of Iraqi forces dotted around the town. I can see at least six or seven points around the city where there are great clouds of black smoke hanging in the air. But these aren't the results of missile strikes-they're pools of oil that the Iraqis have set light to around the city, to try to confuse incoming aircraft and missiles. Its probably true to say that for the first time there was daytime bombing of Baghdad. Previously it had been thought that people could come out in the day, do their shopping and relax a little bit. Driving around the city a lot of government buildings have partially collapsed areas within them, and have had windows blown out. I think the coalition forces are right to say the infrastructure hasn't been hit though as the electricity remained on all night. A Kurdish Democratic Party spokesman insisted that the Kurdish authorities had checked with all of their border posts, and no Turkish forces had passed through in the last 24 hours. He warned however that 40,000 Turkish forces were based on the Northern Iraq border and might well invade the Kurdish area without either Kurdish or American agreement. American and British marines now seem confident that they've secured Iraq's second-largest city, Basra. Intermittent shelling continued around the port city throughout the morning. Troops are now securing the city's vast oil fields, although some have been set ablaze. Giant plumes of smoke dominate the horizon of this historic city; in what looks like an eerie repeat of the last Gulf War, oil fields are ablaze. As we arrived in Basra, I counted half a dozen oil fields billowing smoke and flame. Coming into Basra as part of a massive military convoy, I encountered a stream of young men, dressed in what appeared to be Iraqi army uniforms, applauding the American marines as they swept past in tanks. American predictions that many here would choose to surrender rather than fight appear to have come true. Thousands of demonstrators have converged in central London, marching good-naturedly and shouting slogans. MPs, union leaders, human rights campaigners marched side by side in what they insisted was not a futile gesture now that war had actually started. Outside Downing Street, one woman, overcome with emotion screamed a message through a megaphone - taken to be aimed at Tony Blair: "Stop the War. Do you not understand you are killing innocent people?" The British contingent has begun its push northwards. A fighting force of 8,000, it also takes with it 120 Challenger tanks and 145 armoured vehicles. It will have to replace and relieve the US Marine division fighting for Umm Qasr and further to the northwest, to Iraq's second city of Basra. The British will have to secure supply routes for the Americans and deal with any threats to the places already taken. What I am being told is that the coalition air strikes are very, very precisely targeted, not against the regime in its entirety but against certain parts of the regime. We've seen attacks on the defence and interior ministries, the security apparatus but not on other parts of the administration. What they are trying to do is go after the parts that they see as most closely identified with Saddam Hussein himself and leave other parts more or less intact. They are hoping that people will draw conclusions from those strikes so that they feel perhaps there is something in it for them to abandon the regime. They want to bring down the regime, sow doubt and discord and watch the regime crumble. Umm Qasr hasn't yet been taken in the full sense of the word. There are still pockets of resistance. This is proving a much harder nut to crack for the US marines. There's a continued exchange of small arms fire. We can say the city's new port area is completely secure, and the old port is 95% secure. We have started seeing the debris and seeing the sort of stuff that was thrown at Kuwait City. They weren't weapons that were designed for anything more than for scaring and for terror. But they did take Kuwait City by surprise. People were very frightened by the attack, but things have settled down. There is a sandstorm here. Desert rats are crossing into Southern Iraq with 120 tanks. We have been told they hope to reach Basra in a few hours. There have been a number of prisoners of war giving themselves up to the British and US forces. We counted more than 100 that were being divided into different ranks and being checked for weapons. But I have to say the situation despite those numbers surrendering remains far from secure here. When we got here there must have been up to half a dozen oil fields or oil trenches on fire. This is what it is like being on the wrong end of the world's only superpower. Think of what it must have been like for families living near these targets, huddled indoors as their neighbourhood was torn apart. The main concern of ordinary Iraqis is just to survive. Even in the calm of day when the bombs are not falling the markets are deserted. Now everyone feels it is too dangerous to leave their homes, even to buy food. Ministerial complexes along the banks of the river have been badly damaged. Parts of Saddam's palace has also been attacked. The Iraqis have claimed there have been 207 civilian casualties. It was a very ferocious bombardment. I would be very surprised if people escaped the attack entirely unscathed. We now know that seven British personnel have died after a collision between two Royal Navy helicopters in the Gulf. Coalition sources agree that the commander of the 51st division of the Iraqi army has capitulated and surrendered. It is not known how many of his men have followed. It appears to be in the early stages. Artillery and vehicles have formed formations to show that they are ready to capitulate. Two Royal Navy Sea King search and rescue helicopters have been involved in a mid-air collision over international waters in the Gulf. Seven crew members are missing. All night, convoys of American vehicles have been moving across the desert, literally thousands and thousands of vehicles. It has been a truly impressive sight. In this area, so far, we have encountered no Iraqi forces whatsoever. It is totally quiet at the moment. This marine unit will be moving north and they will be playing a role in securing towns and cities in the region around the Euphrates River. This is part of a broad thrust. I am right on the frontline to the east of Kirkuk in Kurdish held territory. Earlier, there were loud explosions. There was a flurry of about 20mins of activity and anti-aircraft fire as planes flew overhead. I am told by Kurdish leaders that during the day, yesterday, several military targets of significance in Kirkuk were hit and also in Mosul. We are somewhere in the eastern Mediterranean. About 20 aircraft from USS Roosevelt have been involved in strikes on command and control centres and also one of Saddam's palaces in Iraq. They took off in the early hours of this morning and are returning now. They have been carrying some very heavy weaponry. As far as I know all of the planes that took off from the Roosevelt have returned without any damage. These are the first combat missions from the Roosevelt. There are still pockets of resistance here. Declarations by Donald Rumsfeld and others overnight that they have taken control of Umm Qasr are not strictly accurate. US marine infantry are on their way out into the town to try and continue the clearing up operation. Marines have been on patrol all night. There has been intermittent gunfire. There is a painstaking sweep through the town. There is a lot of concern here about reports that Turkish troops have entered Iraq. For much of the day, officials at the State Department have been saying they had no confirmation that it was true. With confirmation now from the Turkish government, I expect there will be a pretty strong and sharp response maybe not tonight but perhaps early in the morning. Officials have made it clear all the way through that they are absolutely opposed to this happening. It is an extraordinary sight as these great B-52 planes touch back down. It is almost 20 hours since they first took off from here yesterday morning and it's almost 10 hours since the bombing of Baghdad began. 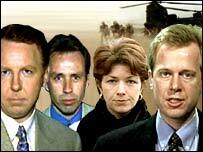 So although we are not being given any information on what precisely they might have been doing, it is quite easy to speculate that they may have been part of that enormous assault earlier on Baghdad. We have been hearing reports that Iraq's 51st Infantry Division has surrendered. If it becomes absolutely clear that this sizeable and important unit has surrendered en masse, then clearly that is exactly the type of thing planners here at central command headquarters want to see. We are waiting tonight for those eight B-52 bombers which left at 1000 GMT to come back. By my reckoning, if they were involved in that bombing over Baghdad, which began at about 1800GMT we could expect them here within the next half hour. But of course we do not know exactly what the flight plan is and precisely when they will be coming back. I heard that the military had left their bases in this 15km closed military zone on the Turkish side of the border. They were sitting on the border and now what seems to have happened is that a first part of that force - 1,500 commandoes - have crossed over into northern Iraq. This does look very like the beginning of a Turkish incursion into northern Iraq. I understand from a good military source that troops were told to leave their bases on the Turkish side of the border and enter northern Iraq. These 1,500 troops will be joined by a larger force to make about 10,000 troops in total. I think this is being done against the express wish of the US. It's a very, very delicate situation in an area which is very, very easily inflamed.